This is an excellent book. 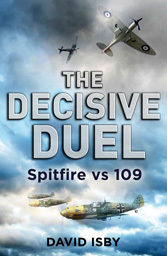 I used it for research in writing the Decisive Duel. It does not appear in my footnotes because I did not quote from it directly and it is not in the select bibliography because it is not in the footnotes. This reflects that is I was doing The Decisive Duel for an academic press, I would have to have had several times the numbers of footnotes and a commensurate increase in bibliography. The book was way big as it was. “Woody” was important in the rise of fighter control. Because of his relationship with Bader, and, through him, to Leigh-Mallory, he set up how it was done from the Battle on. I found the Malta part of the story the most useful, in part because there are an couple of orders-of-magnitude fewer books on the subject. By the way, this is not of purely historical interest. Next time you get to speak to a USAF general, ask him or her why F-22 Raptors do not have Link 16-compatible datalinks and that, while funding for this upgrade is indeed in the FYDP (future years defense plan), ask him or her to consider what places may freeze over before it actually ends up operational. It goes back to Woody, Bader, and the role of situational awareness from outside the cockpit back in 1940.